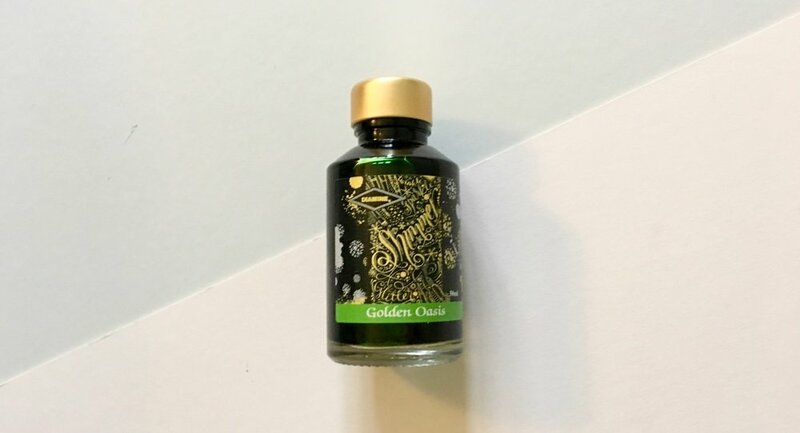 The Diamine Golden Oasis Shimmertastic Ink was sent to me by Executive Pens Direct to review here on the blog. All views expressed on this ink are my own. I have only ever bought and used one shimmer ink, J.Herbins Stormy Grey, and I bought that ink due to novelty and a lot of hype. I very rarely use it and never have this in any of my fountain pens out of pure fear that it'll clog the feed and ruin my pen. I also have a lot of fine nib fountain pens and these don't seem to be the best nib widths to use with a shimmer ink because you’re just not going to appreciate that shimmer. So when I received one of Diamine's Shimmertastic inks in one of my favourite colours I thought I needed to revisit my view on the shimmer and see if anything had changed since the days of Stormy Grey. There are an abundance of shimmer inks out there in the market and Diamine have carved out a good portion of said market. They have a huge range of ink colours that they have added glitter or shimmer too and that range expanded only last year, I presume out of sheer success. I think the shimmer revolution is a fad and something that won't stick around for too long, but despite that it's here and I guess worth looking into. The specifics of this ink colour. 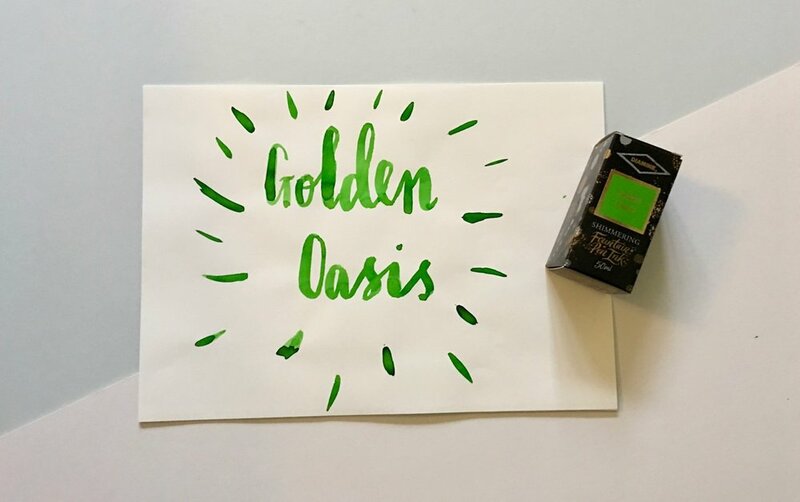 Diamine Golden Oasis is a lovely bright and vibrant green ink that has been paired with gold shimmer to sparkle on your paper. When you really throw some of this ink on the page it glistens but the ink needs to be used liberally to see the benefit. I have seen some shimmer with a fine nib fountain pen but not enough to appreciate it. I love the base green of this ink, it's bright and vibrant. It looks a little bit like Diamine Meadow which I always find a lovely Spring like colour. It's also interesting to use a bright coloured shimmer ink, most of them seem to be darker shades to really get that contrast between the ink and glitter, but this is a sunny shade and it's lovely. It's an ink colour that despite the shimmer I would be attracted to. The best place to see these flecks are in the ink bottle. 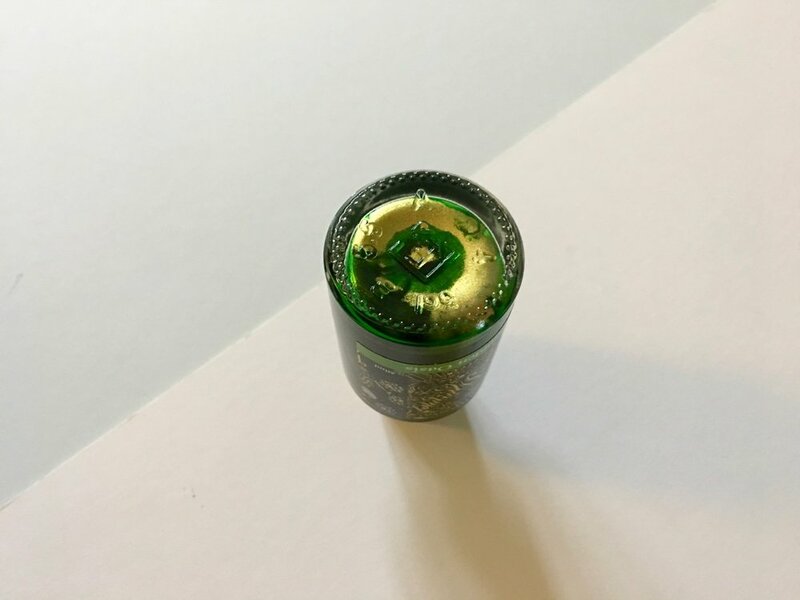 If this has been settled for any amount of time you see a build up of the shimmer at the base of the ink bottle. 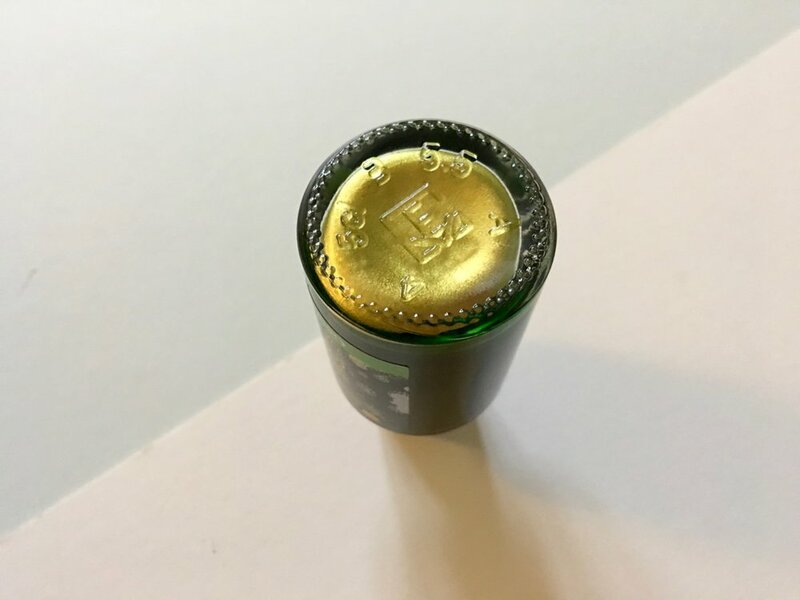 When filling a fountain pen or using the ink you really have to shake up the bottle to make sure the flecks flow through the ink otherwise you won’t see any shimmer. I have used this ink in my Platinum Plasir fountain pen, against my better judgement. After very little time you can easily see the residue build up in the feed where all those tiny gold flecks build up. In my Plasir this doesn't really worry me, but if in a more expensive fountain pen I would probably be crying. I have also tried using Golden Oasis with a paintbrush to attempt brush lettering and this worked fairly well. I have also tested this out with a dip pen. This wasn’t as easy or smooth as with a paintbrush, there was some clogging in the nib which I had to remove every now and again, but the dip pen did show up the shimmer in the ink. 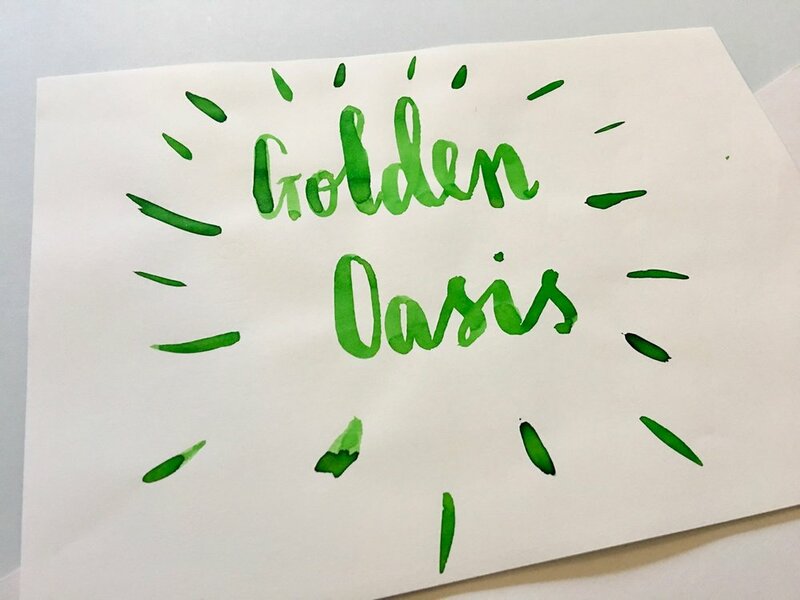 I like Diamine's Golden Oasis ink, it's a great colour thats very bright and fun. This isn't an ink that I would personally use in my fountain pens because I would be too concerned about the damage it could cause. However to use with a dip pen, calligraphy pen or a paintbrush then I think you could really have some fun with this ink. I'd like to that Executive Pens Direct for sending me this ink to review on the blog. Until recently I had never used any Sailor ink but the new range of Jentle inks finally became available in the UK so I decided to order several sample of the different colours on offer. I will be reviewing each of these inks over the coming weeks in a blog mini series. Today’s review focuses on Sailor Blue Black. Originally the blue black ink wasn’t really on my radar, I was interested in the new bright, summery Jentle inks, but on a whim I added this colour to my shopping basket. One of my favourite inks is Pilot Iroshizuku’s Shin-Kai, which I always have in one fountain pen. Because of this I don’t usually shop for blue black inks, however I am glad that I gave this colour a try. I have this inked up in my medium Lamy LX. I chose this pen because I like the nib and its medium width means I can really see all aspects of the colour on the page. It’s turned out to be a really nice pairing and one I will use for some time. Getting down to the ink itself, I really like the colour and how it performs. Sometimes I feel like I shouldn’t get so excited about a simple blue black ink but this one is rather special. The colour is bold with subtle grey undertones. When comparing it to the Pilot Iroshizuku Shin-Kai and Diamine Prussian Blue it looks a little flat on the page. It is much lighter than Diamine Prussian Blue and less saturated than Shin-Kai which is perhaps why I find the ink to be almost like it has a matte finish. I played around with the ink on tomoe river paper and you can see from the photograph below that the ink almost appears to be a navy blue colour. On the highly saturated ink spots there is a small amount of sheen but I wouldn’t say that this was a feature of this ink colour. I am happy I decided to give this colour a try. I quickly used up my sample and ordered a full bottle because I have enjoyed using it so much. It’s really well price at around the £16 mark making it a lot cheaper than the Iroshizuku inks. I think this ink as a great staple colour and so far I have really enjoyed using it. I am a little stumped at the moment with reviews for the site so todays post is slightly different. One of my aims for this year is to finish a whole bottle of ink. With this in mind I thought I would share my modest collection of bottled ink. This exercise is hopefully interesting to you, but should also shed some light on my ink buying habits. Writing out a list of the bottled ink I own highlights some obvious points. I gravitate to a number of ink brands, predominantly Pilot Iroshizuku ink. Once I’ve tried a manufacturer that I like I tend to go through the ink colours and buy several more. I’ve done this again recently with KWZ. My choice of colours is very limited. I seem to sway to the blue and blue/green shades. This is a little disappointing, its like the school mentality of blue ink has followed me into adult life. I need more colour! My Noodlers Black ink is the only anomaly in this list. This ink is waterproof and therefore great to address envelops and for sketching. I have been using this ink a lot in recent months as I try to improve my sketching skills. I doubt this will be the ink I’ll finish this year with an impressive 90ml of it, but I should deplete my stock pretty well. All of the inks in this list are essentially full bottles. I never make it far before being distracted by a new colour which means I have a lot of ink to hand. If I am to finish a full bottle this year it will likely be the Pilot Iroshizuku Shin-Kai even though this is one of the larger bottles. I really enjoy using this ink and usually have it in one or two fountain pens. It’s a year round ink choice for me. Diamine is always a solid choice for fountain pen ink and one of my favourite ink brands. They offer loads of different colours and are really well priced. 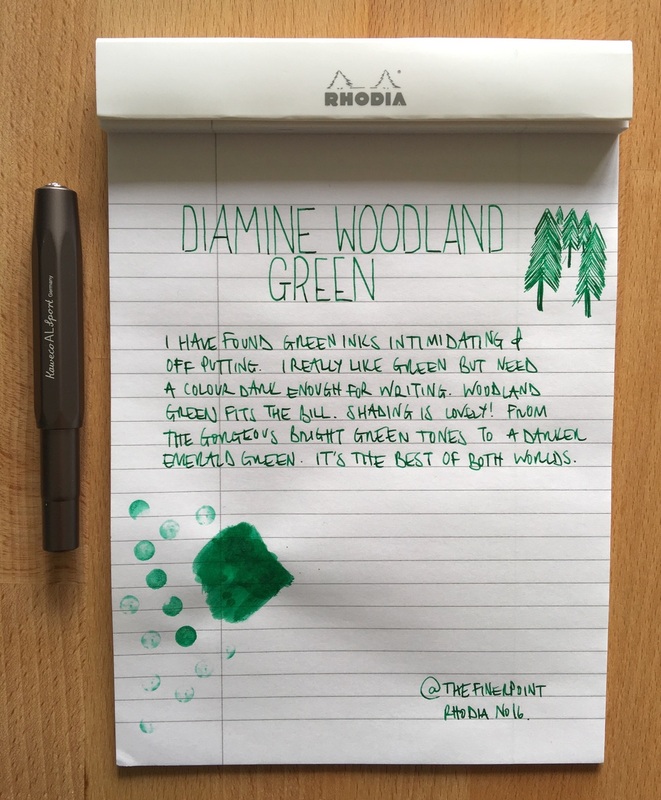 I came across Diamine Woodland Green as part of a Diamine assorted pack of ink cartridges. Woodland Green was part of the Floral pack with lots of lovely bright shades including Orange, Passion Red, Mediterranean Blue and Turquoise. I bought the assorted pack to try several different ink colours that perhaps normally I would not have chosen. Woodland Green was one of the brilliant finds. 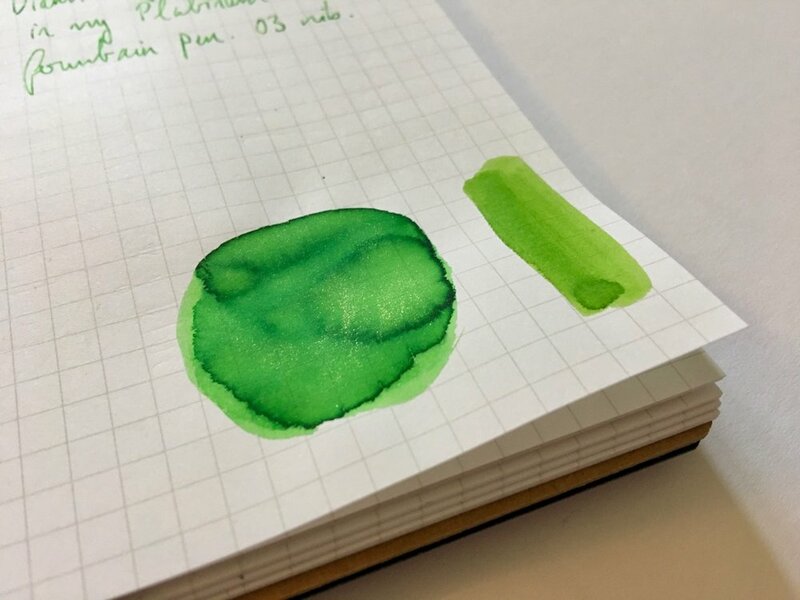 I have always struggled to find a green ink that I wanted to try. It has to be dark enough to be legible on the page and easily visible for the partially sighted such as myself. 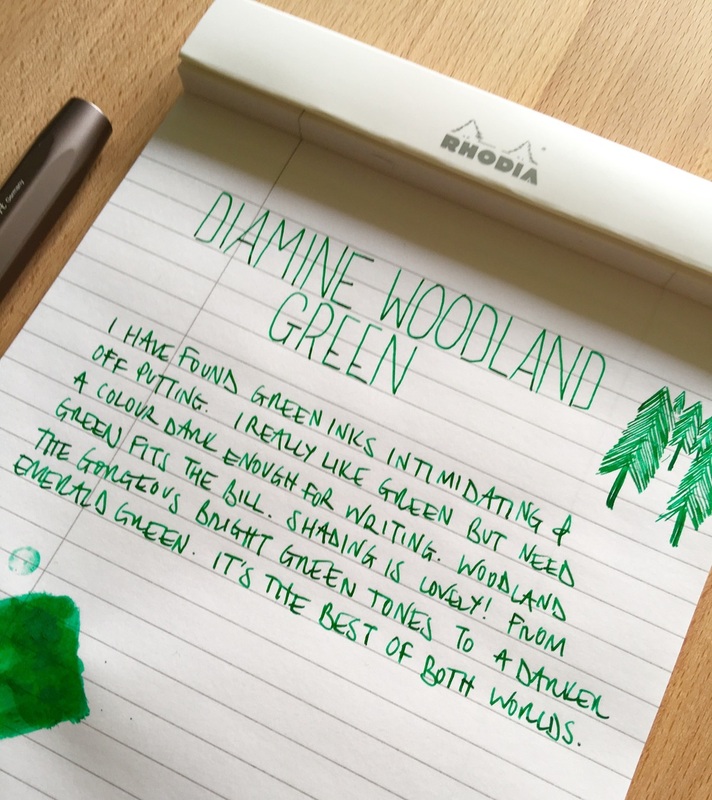 Diamine's Woodland Green fits this bill well. 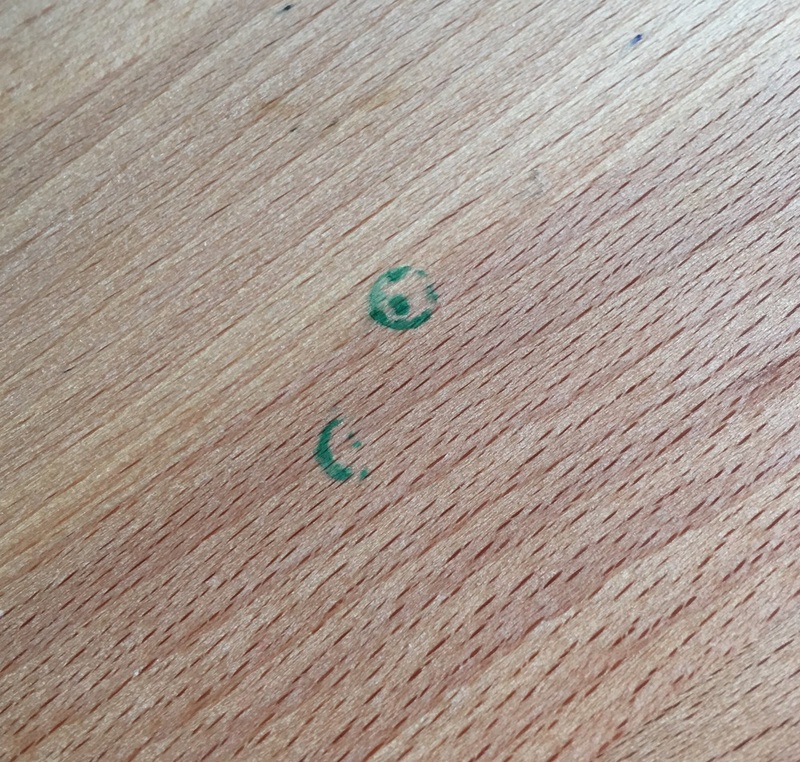 It's a lovely dark green ink colour that has some gorgeous shading. I have used this in cartridge format only predominantly in my Kaweco AL Sport. Even with the fine line of Kaweco AL Sport you can see some of the shading present in Woodland Green. You get a traditional bright green colour in the lighter tones and then the darker tones look almost emerald. As with many other Diamine inks I have used the flow on this ink is great. It's a nice wet ink and I have never had any issues with skipping. If you like green inks this a must for your collection. If you've never used a green ink I think it's a great starting point. The name of this ink is very apt, it reminds me of the woodland areas where I live. Unfortunately I don't have many other green inks to compare this to, but I am very glad I went with this green colour option. It's beautifully bright and bold.